I have a problem with the HPFP control on a 2.0tfsi engine. The car has an autotech update internals in its HPFP and update injectors with 175 bar fprv. The car eat up the camshaft profile of the HPFP so we update to a Dynodrome roller conversion kit. 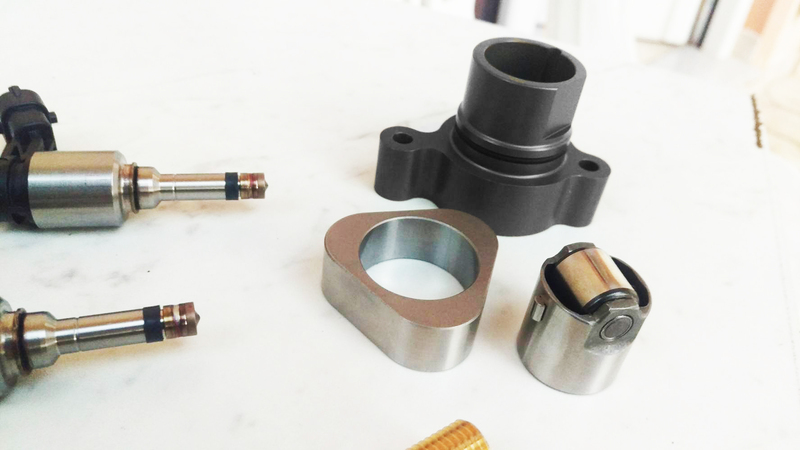 This kit is different than the normal camshaft to to roller conversion kit since it also included updated hpfp cam loop profile . As soon as we did the conversion (Major job, we had to take out the camshaft to remove the camshaft hpfp profile and install the new one) we have big problem controlling the hpfp pressure. Pls bare in mind that we paied special attention on the placing of the hpfp cam profile,and we made sure it was on the stock timing. If we are stationary and we slowly press the throttle, the hpfp pressure will follow the requested perfectly up to 4000rpm. Then the pressure will immediately raise to 180 bars and the engine will die ,since the injector we have will get stuck at 155bar plus . the pressure will remain high until it gets back to idle (as the rpm drops, the request is the same as actual -170bar.When it gets to idle the request goes to 50bar and the actual will drop slowly to 50bars) .When the problem happens you can hear noise coming from the hpfp. If we do the same test on the dyno, with wot 4 gear runs the problem will be the same but it would happen at higher rpms and also the raise of the fuel pressure is more slow. It would eventually get pass 155 bar and the injectors would get stuck making a misfire. The profile is different since it looks like it was more duration.We also measure the depth that the piston of the the hpfp travels, inside the hpfp. It had 2mm difference. We made a spacer to get it to work but its still the same problem. We changed the hpfp with another autotech equip fuel pump and the problem is still there. We change the fprv to the stock one and still pressure raises .And its not even drops after you lift off the throttle which is really strange. We check the fprv and it works. We put the stock hpfp on and the car WORKS. The fuel pressure stays where it should be. Tunning wise I change the stroke, volume and diameter of the hpfp.I did many versions and played a lot with it and nothing changed. Where did the 175 valve come from? Have yo changed the Maxpressure rail map and also the specified pressure maps? There is a difference between getting creep on the FPV and not having them maps set correctly.. It's possible that the maps that dictate the camshaft angle @ highest lift point need modified. Is the replacement cam lobe a 3 or 4 lobe? If 3 lobe, have you used a dial gauge to ensure the maximum lift of the cam lobe matches stock? They are 3 lobe and the profile and lift should be the same..
Its a 3 loop with more duration than stock. As i wrote on the original post we measure the stroke of the new cam profile for the hpfp and its 5mm which is the same as stock. Timing wise the lobe max lift is exactly at the same location as the stock one. Are the maps you talking about DWMSVMN and DWMSVMX ? If so, I already played with them with 0 effect. Littco ,the 175bar fprv came from the same company that sold as the conversion kit. I don't understand your statement about the maps been changed. Pls note that the car was already tune and was running fine (except the fact that it would destroy the cam follower) ,with the same hardware except the camshaft to roller conversion. The maps where ,of course, charged so that we would have enough injector duration to get to the produced 450whp. We changed to the roller conversion, and with the autotech fuel pump we can not get the car to work. Pls note that with the stock fuel pump the car runs fine. Is only when we use an update pump that we have problem. The other thing I dont understand is why I am getting such a high pressure with the stock fprv installed and the maps changed to 110bar requested. It's not FPRV that controls your fuel pressure. The actual fuel pressure control valve is located in the HPFP on the low pressure side. That's why ECU needs all the info about HPFP to correctly calculate duty. I strongly believe that either your HPFP is defective or your maps are way off. Are you getting 150+ bars with stock FPRV? How's that even possible? Are you sure that your FP sensor is not faulty? Exactly. With stock fprv and we tested 3 fprv (2 of them stock), we are getting crazy pressures. It shouldn't be able to go that high. I asked 155 bar with the stock fprv and I got it all the way to 6000rpm on the dyno .How is that even possible? For the quantity of the HPFP I used maps VHDP (from 300 to 550) RQUAHDPK (from 18-30) , SKHDPMX (from 5mmto 7mm), Is there any maps I am missing? Are you sure the N167 valve is working properly? not damaged or broken. this regulates the amount of fuel that gets into the pump, if it's not scaled correctly or faulty then it can simply let all the fuel into the pump without regulation, there will also come a point where the FPRV will not bleed enough fuel off and creep anyway so sky high pressures are seen. Also maybe your HPFP is just knackered, especially as the stock one was working ok! This is N167 valve is the one the HPFP? I already change to another autotech equip complete HPFP and the problem is still there. So its not the pump and not the n167 valve. I am missing any more maps for the HPFP calibration? I am doing something wrong? Take a look at modules %AMSV, %VSTMSV and %HDPRSOL in MED9 FR, you might find a clue. Wish I could be more specific. Did you tried another hpfp, I've seen some hpfp upgrades that have a slight different measurements than others, try the stock hpfp with a stock frv and request something like 135 and give it a try. Does the low pressure drop off then the hpfo start to creep? hpfp control is based around a static low pressure supply. As the low pressure falls away from demand the hpfp starts to creep up from demand. Work on low pressure first and high pressure will start to work better. I was seeing high 5's and low 6's during pulls. This is my current KFNTBKS and it seems happy with unmodified LP hardware. On a pull I see from 4.2-4.8bar which I feel is "stable". KFFLAF is massaged for the TT-RS pump. ive had this issue before also and it was the position of the lobe on the intake cam for the HPFP. if its even slightly off the ecu cannot control the duty cycle and you will have crazy pressure even with stock FPR.